In the past, we’ve reviewed eShave products and always came away impressed. The Orange Sandalwood Collection for shaving was hailed as one of the best shaving products ever by Men’s Health magazine in 2011. And eShave After Shave Soother was named the best post-shave lotion by Men’s Health in 2012, so who were we to argue? After all the awards, it became apparent: Men’s Health was either trying to sleep with eShave, or eShave products are really that good. We decided it was the latter based on personal experience, but we also wouldn’t be surprised if eShave was a complete monster in the sack to boot. Previously, eShave focused solely on producing luxury shaving products and accessories, but now, eShave wants to take over your entire head! eShave Hair Styler is a part of the “New Generation” of eShave products that actively addresses all of a man’s grooming needs. And frankly, just the thought makes our hair follicles stand on end. Hair Styler from eShave provides the structure and control of a strong gel with the pliability of the wax. The new styling paste transforms the hair by adding weightless body and texture, definition and flexible hold, made with a naturally derived sugar-based emulsifier that enhances hairs moisture and hydrating Beeswax that softens the hair and adds volume. Hair Styler is labeled as a “bodified styling paste.” It was the first paste I have ever applied that used a pump to disperse the product, and I really liked it, because as a regular user of styling paste, I find myself using more than I even need, because typically you need just a dab or two to get the desired effect. When I first had the product in my hand, it had more moisture than I am used to from a paste. So, I judged it on appearance, just like I did the first time I saw Color Me Badd in concert. But just like with Color Me Badd, I was way off and was only screwing myself by judging it in the first place. The fact that the paste had more moisture actually made it easier to apply. Usually with a paste, you have to commit that dab to a particular area and that’s it. But the eShave product was especially nimble and supple. It held my hair in place (as I would find over the next several hours), but it had similar traits to a gel in terms of feel while applying it. 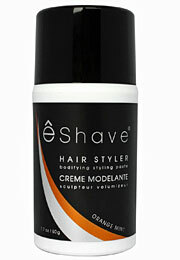 eShave Hair Styler retails at just $17 per bottle and can be purchased on the eShave website.